In any family law case, the divorce judgment (formally known as the Judgment for Dissolution of Marriage) is by far the most significant document. In short, the judgment is the final divorce document which outlines the resolution of all legal issues in the case (disputed and agreed-upon). It is vital to consult with an experienced family law attorney before signing any judgment paperwork or filing your judgment with the court. If your judgment contains omitted assets/debts or fails to include necessary provisions, you could be dragged back into litigation over these errors. A Certified Family Law Specialist will be able to spot the issues in your case and ensure that all matters are handled appropriately. Depending on the language of the judgment and the significance of any errors, an omitted asset or debt has the potential to re-open the entire agreement for litigation/negotiation. Further, if an asset or debt was omitted from a judgment intentionally by one of the parties in an effort to deceive his or her spouse, the court would have the ability to provide various remedies to the innocent spouse. If the judgment as a whole should be set aside, divorce attorneys will advise their clients that it is essential for the spouse considering a motion to set aside judgment to consider this option quickly. The court enforces strict statutes of limitations which apply to motions to set aside. Therefore, if a spouse fails to act quickly (most of the time within six months of entry of judgment) he or she will miss the opportunity to attack the judgment at all. The date of termination of the marriage is stated in the family law judgment. This is the date the parties’ marital status changes from “married” to “single” and they are legally permitted to re-marry. 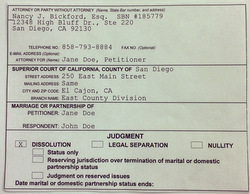 In a divorce proceeding in San Diego, there is a six-month waiting period beginning on the date the Respondent is served with the Petition (or returns the Notice and Acknowledgment of Receipt) before parties can terminate their marital status. Therefore, it is important to know that even if your judgment is entered prior to the end of the six-month waiting period, you will not be legally divorced. Divorce attorneys are frequently asked about this six-month waiting period and a knowledgeable attorney should be able to explain how this pertains to your case. As stated above, your judgment is the most important document in your divorce. One of the reasons the judgment is so vital, is that it extinguishes all prior orders when it is entered. During the pendency of a divorce, the parties may obtain temporary (pendente lite) orders about issues such as spousal support or reach agreements regarding custody of children that are filed as stipulations with the Court. Before judgment is entered, these orders are legally binding on the parties. However, after judgment is entered, these orders and agreements are void and the judgment controls. This is true even if the judgment does not address issues previously covered by court orders or stipulations. Therefore, it is crucial to incorporate any prior orders into the judgment that the parties wish to remain enforceable. If you are considering a divorce from your spouse and have questions about filing a judgment, please contact us. Consulting with an experienced divorce attorney is crucial when finalizing your divorce. Nancy J. Bickford is the only attorney in San Diego County representing clients in divorces, who is a Certified Family Law Specialist (CFLS) and who is actively licensed as a Certified Public Accountant (CPA). Don't settle for less when determining your rights. Call our office in San Diego at 858-793-8884 for more information about the consultation process.